The Tribe of Dan is missing in the Book of Revelation, so why are they not there? When Israel grew into a nation while being in captivity or slavery in Egypt, they still managed to retain their identity so each of the twelve tribes would be separated when they entered into the Promised Land in Canaan, but the Tribe of Dan was different than the other tribes. They seemed to be more independent of the other tribes, often doing things without the counsel or knowledge of the other tribes. It’s as if the Tribe of Dan is a free radical…doing what they want, but in the process, hurting the nation as a whole as well as themselves, so where did the Tribe of Dan go wrong? Why were they excluded from the lineage of Israel? Are they lost forever and have they disappeared from the pages of history? The Tribe of Dan didn’t take long to fall into idolatry. Maybe that’s why Dan was not even listed among the genealogies given in 1st Chronicles 2:2. The root of the problem comes to the forefront in the Book of Judges and at a time when there were no kings and everyone did what was right in their own eyes. We read “the people of Dan sent five able men from the whole number of their tribe, from Zorah and from Eshtaol, to spy out the land and to explore it. And they said to them, ‘Go and explore the land.’ And they came to the hill country of Ephraim, to the house of Micah, and lodged there” (Judges 18:2), so “the five men departed and came to Laish and saw the people who were there, how they lived in security, after the manner of the Sidonians, quiet and unsuspecting, lacking nothing that is in the earth and possessing wealth, and how they were far from the Sidonians and had no dealings with anyone” (Judges 18:7). The five men lusted after or coveted the land where the people of Laish lived and they wanted it for themselves, even though it was not theirs to take and God had never given them permission to take it, but the men came back and reported it to the Tribe of Dan and they said, “Arise, and let us go up against them, for we have seen the land, and behold, it is very good. And will you do nothing? Do not be slow to go, to enter in and possess the land. As soon as you go, you will come to an unsuspecting people. The land is spacious, for God has given it into your hands, a place where there is no lack of anything that is in the earth” (Judges 18:9-10). After the Tribe of Dan decided to take the land, they went to “the valley that belongs to Beth-rehob. Then they rebuilt the city and lived in it. And they named the city Dan, after the name of Dan their ancestor, who was born to Israel; but the name of the city was Laish at the first. And the people of Dan set up the carved image for themselves, and Jonathan the son of Gershom, son of Moses, and his sons were priests to the tribe of the Danites until the day of the captivity of the land. So they set up Micah’s carved image that he made, as long as the house of God was at Shiloh” (Judges 18:28b-31), so they became idolaters and even though they knew better, the “people of Dan set up the carved image for themselves, and Jonathan the son of Gershom, son of Moses, and his sons were priests to the tribe of the Danites until the day of the captivity of the land” (Judges 18:30). You might notice that even the priests were not of the Levitical family, so not only was Dan falling into idolatry, they were deciding for themselves who the priests would be, so they reasoned, “Who would be a better priest than the son of Gershom, who was the son of Moses?” What they were doing is what a lot of people do today, they compromised God’s Word and disobey but justify their actions as being right in their own eyes. When we read the Book of Revelation, we see a listing of the Twelve Tribes of Israel, but one is missing…in fact, more than one. Ephraim is missing too along with the Tribe of Dan. 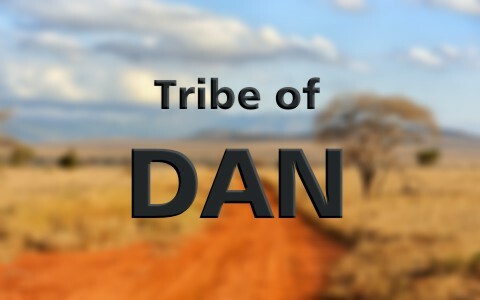 When the original tribes were mentioned, Dan was listed among them (Gen 29-30) and they also appear when they were being numbered, along with the rest of the nation of Israel in the Book of Numbers (hence, the name) in chapter 1, but from this point forward, the Tribe of Dan is not listed among the other twelve tribes and instead, Ephraim and Manasseh is mentioned, who were the two sons of Joseph that Jacob adopted as his own, but then later, in the Book of Revelation chapter 7, even the Tribe of Ephraim is missing but not Manasseh, so why was Dan missing and Ephraim not mentioned in Revelation? It appears they were gone for the same reason that Dan was missing…idolatry and rebellion against God. Will the tribe of Dan be lost forever? Will they ever appear in history again? Apparently, Ezekiel the Prophet thinks they’ll be around again, at least in the future, as he writes that they are apportioned the first section of land in the coming Millennium (Ezk 48:1), so maybe we haven’t heard the last of Dan. We don’t see the Tribe of Dan mentioned in latter ancient records of Israel and they are not found in the Book of Revelation, but that doesn’t mean they’ve been forsaken forever because God has plans for His chosen people and we can see that it includes the Tribe of Dan (Ezk 48), but what role they play in the coming kingdom is yet to be seen. At that time, idolatry will be a thing of the past and the Tribe of Dan will have learned their lesson, so once again, someday, the Tribe of Dan may resurface, but in an entirely new setting. The lesson for us to learn is that the Tribe of Dan fell into idolatry and were cut off from their brothers, at least for a time, and all who forsake God will also be cutoff, but today, if you hear His voice, put your trust in Him and you will be saved, and since the Lord could return at any moment, make today your day of salvation (2nd Cor 6:2), because tomorrow may be too late. I did not notice the tribe of Dan missing from the book of Revelation (I read through every year). Odd since Manessah is and Manessah is from the tribe of Joseph (Ephraim and Manessah Numbers 1:10; Joseph and Manessah is mentioned and they are of the same tribe. I wonder if Dan is missing because of Genesis 49:16? Who can say, but Revelation does say All the tribes. It is also interesting to note Samson is a Danite.